Recently I came across a pyramid describing steps the creator, Kathy Johnson took to assist her daughter with her learning disabilities. She claims her child moved into being a successful student as well as enjoying both raised self esteem and and increased IQ. I found this material, brief as it is, useful. I like the progression and the commitment to looking at different approaches as part of whole to reach results. It is my experience as a dyslexic/hyperlexic that diversity of healing approaches is essential. I just wish there were two more elements, emotional and spiritual on the pyramid. The following is a quote from Ms. Johnson’s site. “As an overview, the base of the Pyramid is Body and Mind Health. In order for the brain to be working at its best, the cells must be healthy. Just above that is Neuro-Development. Between pre-natal and age 3, we go through many stages that develop our brains and bodies, and open up pathways to our higher brains. Next is Sensory-Motor Development. If we cannot see, hear, or feel well, it is difficult to get proper input to our brains. We need to be able to use large and small motor abilities to properly express what we know. 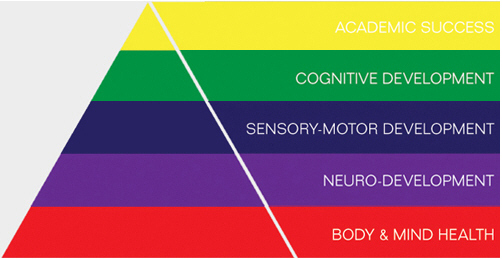 Our Cognitive Development of skills (like processing speed, memory, and reasoning) is dependent on the other parts of the Pyramid; neuro-development and the sensory-motor systems must be in proper working order to develop fully in the cognitive area. First of all let me tell you a little bit about PEN. The acronym stands for Parents Education Network, a coalition of parents collaborating with educators, students and the community to empower and bring academic success to students with learning and attention difficulties. If you live in the San Francisco Bay area and have children with these challenges, this is a lively group, well worth your time and energy. In mid-March PEN Speaker Series welcomed Patricia Oetter talking on Sensory Integration: Do we really need it? She began her presentation defining the senses. Nerves can best be described through neurobehavioral organization. These sensory neurons work in tandem with our motor neurons. Why? We need to do something with the neuro-sensory part of our selves. I referred to biologyreference.com for a little more detail. Sensory neurons bring information about the world within and around the body from sense organs to the brain and spinal cord. Motor neurons carry messages from the brain and spinal cord out to the muscles and glands. An example: if a mosquito lands on a person’s arm, sensory neurons in the skin send a message to the spinal cord and then the brain, where the message is understood, and a reaction formulated. The brain’s response may be to use motor neurons to cause muscle contractions resulting in a slap on the skin. Vestibular system. This sense contributes to our balance and our sense of spatial orientation. It’s the sense that is about being in motion and knowing how to handle oneself. She reminded us that children learn balance by falling down purposefully – it’s movement through space. Proprioception. This sense indicates where the various parts of the body are located in relation to each other. Ms. Oetter cautioned us to remember that our senses are continually providing information to the brain which means that in any given moment, a person may react in one way or another, depending on what sense is dominant at that moment. For this reason she seemed to eschew placing too much emphasis on the phrases “hyper” meaning beyond or excessively or “hypo” meaning under or below normal. She re-iterated for the teachers present: A student in a state of hypo-activity is just in a momentary state. Before you know it, the student may become hyper-active. She talked about the intensity of sensation which is experienced through the duration of its frequency and pattern: novelty vs repetition. She explained that the neuro-chemistry inside our cells when turned up or down are a part of how we perceive something. Our cells are turned up when we are not feeling comfortable or safe. She had an interesting comment that touch is the key for vision: If you don’t know what is going on with your vision, your body doesn’t know where it is. Ms. Oetter made a sobering comment. It takes 25 – 30 years of age before the brain is mature enough to handle the senses. It seems it takes that long for mylenation, the development of an insulation material to form a layer, usually around a neuron. This sheath is essential for the proper functioning of the nervous system. One of the components that ensures mylenation is the condition of feeling safe. She reminded us that boys, girls, young adults, all of us actually, need smiles and touch to find a way to feel safe. There is so much more information that Ms. Oetter shared. However, now brevity is important. I would like to comment on the value of these lectures sponsored by PEN. Over this last year I have attended most of them. As a dyslexic and hyperlexic these perspectives have been very useful to me. And, as each dyslexic/hyperlexic has different reasons for their challenge I know it is important to examine a wide variety of solutions. Each speaker gave me another clue into how I function or not. 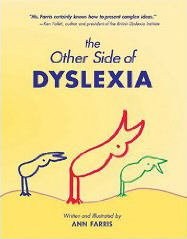 In Ms. Oetter’s case, over the last twenty years I have focused on my senses to understand some of my dyslexic behavior. I found her information most helpful. It gave me another point of view on the topic. I just wish that parents and teachers challenged with children who have learning issues were in attendance in droves so they, too, could learn. These lectures are one of the best “buys” in the Bay Area.